A goal of the Affordable Care Act is to increase competition and transparency in the markets for individual and small group insurance, leading to higher quality, more affordable products. Information on proposed premiums in the individual and small group markets has recently been made available by selected states, and it is now possible to move from theoretical arguments to data-driven analysis. This research brief analyzes proposed rates in the individual market for 2014 in the eleven states that have made information available, and compares these rates to those estimated by the Congressional Budget Office. Further, for six states, we compare the rates that will be charged to small employers with the average amount that small employers would have been expected to pay in 2014 for comparable coverage and a comparable population. Overall, silver premiums in the 2014 individual and small group markets are nearly 20% lower than expected. A goal of the Affordable Care Act is to increase competition and transparency in the markets for individual and small group insurance, leading to higher quality, more affordable products. To date, this proposition has largely been based on theory. The early market reforms, such as requirements for a minimum Medical Loss Ratio and for review of proposed rate increases of 10% or greater, have clearly created value for consumers. Further, data from the Medical Expenditure Panel Survey Insurance Component (MEPS-IC) shows that the average premiums for employer sponsored insurance increased by only 3% from 2011 to 2012, the lowest rate of increase observed since the data series started in 1996. However, the major changes in the rules for individual and small group insurance will begin in plan year 2014. Information on proposed premiums in the individual and small group markets has recently been made available by selected states, and it is now possible to move from theoretical arguments to data-driven analysis. This research brief analyzes proposed rates in the individual market for 2014 in the eleven states that have made information available, and compares these rates to those estimated by the Congressional Budget Office (CBO). Further, for six states, we compare the rates that will be charged to small employers under the Affordable Care Act with the average amount that small employers would have been expected to pay in 2014 for comparable coverage and a comparable population. Details about our methodology and assumptions are available in the methods section. In the eleven states for which data are available, the lowest cost silver plan in the individual market in 2014 is, on average, 18% less expensive than ASPE’s estimate of 2014 individual market premiums derived from CBO publications. Further, the lowest cost silver plan available to small employers in 2014 in the six states with available data is estimated to be 18% less expensive, on average, than the average premium that small employers would be paying for a pre-Affordable Care Act silver plan trended forward. These preliminary rates may be further lowered before health plans are offered in Marketplaces this fall. Already, in a number of states (DC, OR, RI, VT), the rate review process and competition are resulting in final rates that are significantly below rates proposed earlier this spring. Preliminary premiums appear to be affordable even for young men – a group about which there has been concern about “rate shock.” There are approximately 750,000 young men (ages 18-34) who will not qualify for a premium tax credit who are currently enrolled in the individual market. In Los Angeles County (the county with the largest number of uninsured Americans in the nation), the lowest cost silver plan in 2014 for a 25-year-old individual costs $174 per month without a tax credit, $34 per month for an individual whose income is $17,235 (or 150% of the Federal Poverty Level), and a catastrophic plan can be purchased for $117 per month for an individual. From the premiums released by eleven states, the lowest cost silver premium in the individual market is 18% lower than the ASPE-derived CBO estimate of 2014 individual market premiums (Figure 1), and premium from the second lowest cost issuer is 10% lower than the ASPE-derived CBO estimate (Figure 2). As noted in the methods section, we make some assumptions about medical trend and about reinsurance parameters for the Affordable Care Act reinsurance program in order to infer a 2014 premium consistent with the 2016 CBO premium estimates, and we make assumptions about the age distribution of individual market enrollees in order to compare the proposed premiums by age group for 2014 with the average premium estimated by CBO. With that caveat, we are quite confident that the average premiums proposed by the lowest cost and second lowest cost issuers in the eleven states where data are available are substantially below the second lowest cost plan that was inferred from the CBO in its modeling. It is theoretically possible that the eleven states for which we have data are not representative of the rest of the nation, and that when data are available from all fifty states and the District of Columbia that the national averages will be much closer to the ASPE-derived CBO estimates. However, we note that the weighted average small group premiums from MEPS-IC data in these eleven states is close to the national average, and that data on per capita health spending in these eleven states from the CMS Office of the Actuary’s National Health Accounts also shows the weighted average per capita spending in these states are close to the national average. Thus, it seems unlikely that data from all states will be much different. For individual states, however, it is possible that the state-level premiums could be closer to ASPE-derived CBO estimates, while national or multi-state averages remain below ASPE-derived CBO estimates. We note that, although the ASPE-derived CBO estimate of 2014 premiums is higher than the actual 2014 premium costs seen to date, the ASPE-derived CBO estimate was still much closer to actual 2014 premiums than those of many other analysts. For example, in a 2009 report, Oliver Wyman estimated that the average premium for an individual purchasing coverage in the individual market would be $4,561(or $380 per month) in 2009 dollars due to the Affordable Care Act reforms, and that this would represent a 54% premium increase over the status quo. It is not clear from the report what actuarial value (AV) level the Oliver Wyman analysis assumed, but it seems likely that the assumption was for an AV no greater than a silver level, and, probably, less. We trended forward the 2009 estimate to 2014 dollars using CMS Office of the Actuary trends in private health insurance per person, which is almost certainly a substantial underestimate of the rate of increase in individual market premiums. This yields a 2014 estimated premium of $5,400 annually, or $450 per month. Even using this low estimate of trend, and assuming the average individual market actuarial value is in the silver range (which is likely an overestimate), the Oliver Wyman predictions are clearly far above the reality of 2014 premiums. In the eleven states with available data 2014 premiums average $321 per month for the lowest cost silver plan, and $352 per month for the second lowest cost issuer. Note: Ohio and Virginia have not yet posted premiums for all issuers; the numbers presented here may be higher than the lowest cost 2014 silver premiums when all filings are posted. Sources: Congressional Budget Office estimate derived as described in footnote 19. State data from publicly available sources, weighted by RAND COMPARE estimate of enrollment by age in the individual market in 2014. US average constructed by weighting each state according to its proportion of individual market enrollees per the 2011 Medical Loss Ratio filings. In the six states for which small group data is readily accessible, the lowest small group silver premium for single coverage, weighted by small group age distribution, is 8% to 36% lower than the estimated pre-Affordable Care Act 2014 small group average premium for single coverage, averaging 18% lower across these six states when weighted by total small group market size. Similarly, the small group premium from the second lowest cost issuer for 2014 is 6% to 36% lower than the estimated pre-Affordable Care Act 2014 small group premium (Table 1), averaging 15% lower across these six states. In addition, the State of New York has reported that its 2014 small group silver premiums are nearly 32% below CBO projections. As noted in the methods section, the data available for 2014 is different in kind from the pre-Affordable Care Act data. For pre-Affordable Care Act, we have reported average premiums in 2011. We assume, based on data from two independent sources, that the average small group enrollee with single coverage is enrolled in a silver plan, but there is some uncertainty about this assumption. In addition, there may be variations in the average actuarial value of small employer plans by state, which we do not account for here. We use the Current Population Survey to estimate the age distribution of employees covered by single policies by small employers, and the uniform age curve specified by CMS to estimate the average amount that small employers would pay in 2014. Part of the reason that we estimate such substantial savings for small employers in 2014 is that we are comparing average premiums in the pre-Affordable Care Act environment to lowest cost and second lowest cost issuer premiums in 2014. Some employers offering silver plans in 2014 may choose more expensive silver plans than the lowest cost or second lowest cost issuer options, in part because they or their employees value the wider networks that the more expensive plans may offer. But it is clear that all small employers have the option of choosing the lower price offerings, and for small employers, on average, these lower price offerings appear to offer substantial savings below the status quo for a comparable benefit package and a comparable population. Sources: For average small group premiums, 2008-2011 MEPS IC trended forward to 2014. See http://www.irs.gov/pub/irs-pdf/i8941.pdf. For 2014 small group market, publicly available premium data, weighted using CPS age distribution of small group employees with single coverage described in footnote 24. Note: For pre-Affordable Care Act data, analysis assumes that the average Actuarial Value for small group plans was approximately 70%. It seems likely that there is state-level variation in average AV, but reliable state-level data on average AV in the small group market is not available. In Oregon, two issuers lowered their proposed 2014 individual market premiums within days of the State of Oregon’s public release of 2014 premium information. In addition, through the state’s rate review process, the Oregon Insurance Division lowered proposed rates for individual plans by between a few percentage points to 30 percentage points. For small employers, the Oregon Insurance Division lowered rates from a few percentage points to 12 percentage points. In the District of Columbia, United Healthcare submitted a 10% rate reduction for small businesses after rates were posted publicly. The Green Mountain Care Board, which runs the Health Insurance Marketplace in Vermont, lowered proposed rates from Blue Cross Blue Shield of Vermont and MVP Health Care by 4.3% and 5.3%, respectively. Through its rate review process, the Rhode Island Office of the Health Insurance Commissioner lowered proposed rates in the individual market by 5.2% for Blue Cross Blue Shield of Rhode Island, and by 9.6% for Neighborhood Health Plan of Rhode Island. The Office of the Health Insurance Commissioner also lowered proposed rates in the small group market by between 1% and 8.2%. In addition to these examples in which effective rate review caused approved rates to be below those initially proposed by insurers, it is clear that the requirement that all rate proposals of 10 percent or greater be reviewed for reasonableness created a strong sentinel effect, and reduced the number of proposals with increases above 10%. In the individual market in 2010, 75% of all rate proposals were for increases greater than 10%, a statistic that declined sharply to 34% of all rate proposals in 2012, and to 14% in partial data for 2013. The average increase approved in 2012 and the first part of 2013 was 30% lower than the average increase approved in 2010. Evidence is also emerging that the concerns expressed that millions of young men will be priced out of coverage due to the new rating reforms may be unfounded. First, an analysis of the individual market today shows that young men with income above tax credit eligibility (400% of FPL) comprise a small fraction of enrollees: 7 percent of the 10.8 million total individual market enrollees, or about 750,000 in 2011 (See Table 2 below). Overall, nearly 60 percent of young men ages 18-34 currently enrolled in the individual market may be eligible for tax credits or Medicaid if their state implements the Affordable Care Act’s Medicaid eligibility expansion. Second, preliminary information suggests that premiums will be affordable for this group, even without eligibility for a premium tax credit. In Los Angeles for example, for a 25 year old individual the lowest cost silver plan is $174 per month, and the lowest cost bronze plan is $147 per month. Premiums in Portland are very similar—$174 per month for the lowest cost silver plan for a 25 year old individual and $133 per month for the lowest cost bronze plan. In Albuquerque, a 25 year old could pay as little as $143 for a silver plan. Individuals under the age of 30 will also be eligible for catastrophic coverage, and those under the age of 26 may be eligible for coverage on parent’s policy. In Los Angeles, California, the lowest cost catastrophic plan is $117 per month for a 25-year-old individual. In Albuquerque, New Mexico, the lowest cost catastrophic plan is $109 per month for a 25-year-old individual. In Portland, Oregon, a 25-year-old individual could pay as little as $89 for a catastrophic plan. Third, tax credits will help many young men in this market. To illustrate the impact, a 25 year old in California with income of $17,235 (150% of poverty) could pay as little as $34 per month for a silver plan in North Los Angeles, and could purchase a bronze plan for as little as $7 per month. Source: ASPE analysis of the 2011 National Health Interview Survey. Eight states have posted health insurance premiums for their state-based Marketplace, and an additional three states have posted health insurance premiums for their Federally-facilitated Marketplaces or State Partnership Marketplaces. In each of these states, information is available on the proposed premium payments, by age, for each of the issuers that is proposing to sell plans in the individual market. In addition, information on proposed rates in the small group market is readily available for all issuers in six of these states. Due to data limitations, we are unable to directly compare the ASPE-derived CBO estimates to the price of the second lowest cost silver plan in 2014. Therefore, we have presented a comparison to the lowest cost silver plan as well as a comparison to the second lowest cost silver issuer. It is likely that the second lowest cost silver plan will differ very little in price from the lowest cost silver plan, as both plans will often be from the same issuer. Our estimates here can be thought of as a range that captures the second lowest cost silver plan in each state. Data on premiums in the pre-Affordable Care Act small group market come from the Insurance Component of the Medical Expenditure Panel Survey (MEPS-IC), conducted by the Agency for Healthcare Research and Quality (AHRQ). MEPS-IC surveys approximately 38,000 employers each year, and gathers information on the average premium paid. In order to increase sample size in each state, we average data from the 2008 to 2011 MEPS-IC, and trend the estimates forward to 2014 using estimates from the CMS Office of the Actuary of trends in private health insurance per person. Analysis of data from the Health Intelligence Company, LLC (HIC) database that was used by HHS in the development of the Actuarial Value Calculator estimates that average AV for single coverage in the small group market is very close, on average, to silver coverage, with an average AV of 69% for single coverage in 2010. Analysis of data from the 2012 Employer Health Benefits Survey finds that the average deductible for single coverage in small group plans is about $1,900, the average maximum out-of-pocket is $3,300, and the average coinsurance rate is approximately 20%. Taking into account that about 30% of small group plans in the sample only cover generic prescription drugs, and nearly two thirds do not apply prescription drugs to the maximum out-of-pocket limit, the KFF/HRET data also supports an average small group AV in the silver range. Thus, it is appropriate to compare pre-Affordable Care Act small group premiums trended forward to proposed silver premiums in 2014. We collected 2014 small group market silver premiums by age from the following six states: Colorado, the District of Columbia, New Mexico, Oregon, Vermont, and Washington. To create weighted average premiums that are comparable to pre-Affordable Care Act small group market average premiums, we weighted posted small group market premiums in 2014 by the age distribution of workers in small firms who have single employer-sponsored insurance coverage. Given the changes in pricing practices and information available due to the Affordable Care Act, our comparison of pre-Affordable Care Act average small group premiums to proposed 2014 small group premiums inevitably uses different data for pre- and post-Affordable Care Act. For the 2014 proposed small group premiums, we have actual prices by age and metal level. For the pre-Affordable Care Act data, we have an average premium paid by small employers in each state. To compare these, we estimated the average AV in the current small group market, as well as the age distribution. We note that there is uncertainty about each of these assumptions, as well as variation in average small group actuarial value by state, which we have not taken into account here. Tax credits can not be used for the purchase of catastrophic plans. We trended forward to 2014 using estimates of per enrollee private health insurance spending increases from 2012 to 2013 and 2013 to 2014 from the Office of the Actuary described in footnote 8, as well as 2009-2010 and 2010-2011 estimates from https://www.cms.gov/Research-Statistics-Data-and-Systems/Statistics-Trends-and-Reports/NationalHealthExpendData/Downloads/tables.pdf. The 2011-2012 estimate, also from the Office of the Actuary, was 2.9%. Many people would expect that actual trend will be higher than these estimates, particularly for individual market premium growth. To the extent that actual trend is higher, our analysis is conservative – that is, true savings are likely higher than those estimated here. The pre-Affordable Care Act average premium is based on MEPS-IC survey data. In the pre-Affordable Care Act market, most states allowed health status rating in the small group market, often restricted to a “rate band” of +/- 35% of the base rate. As of January 1, 2014, this practice is no longer allowed for new or renewing small group health plans. 2012 Annual Rate Review Report: Rate Review Saves Estimated $1 Billion for Consumers. Centers for Medicare and Medicaid Services. September 2012. Available at: http://www.cms.gov/CCIIO/Resources/Forms-Reports-and-Other-Resources/rate-review09112012a.html. Oregon Department of Consumer & Business Services press release. July 10, 2013. Available at: http://www.oregon.gov/DCBS/docs/news_releases/2013/july10ratedecisions.pdf. UnitedHealthcare Lowers Rates for the District of Columbia’s Health-Insurance Exchange - A Sign Competition Is Already Cutting the Cost of Buying Insurance. DC Department of Insurance, Securities, and Banking. June 26. 2013. Available at: http://disb.dc.gov/node/567902. Care Board Trims Rates for Vermont Health Exchange. Burlington Free Press. July 8, 2013. Available at: http://www.burlingtonfreepress.com/article/20130708/NEWS03/307080022/Care-Board-trims-rates-Vermont-health-exchange. OHIC Approves Commercial Health Insurance Contracts, Rates and Rate Factors. State of Rhode Island Office of the Health Insurance Commissioner. June 28, 2013. Available at http://www.ohic.ri.gov/documents/2013%20Rate%20Review%20Process/2013%20Rate%20Review%20Final%20Decision/1_2013%20Rate%20Review%20Process%20Final%20Decision%20Press%20Release_FINAL.pdf. Health Insurance Premium Increases in the Individual Market Since the Passage of the Affordable Care Act. Chu R, Kronick R. February 2013. 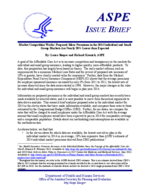 Available at http://aspe.hhs.gov/health/reports/2013/rateIncreaseIndvMkt/rb.cfm. From the 2011 submissions of Medical Loss Ratio data to the Centers for Medicare and Medicaid Services, there are 10.8 million enrollees in the individual market. New Mexico has not yet posted bronze rates for 2014. Table 2 was developed based on internal analysis of the 2011 National Health Interview Survey. This analysis used adults only, and defined individual market coverage as those with private insurance who indicated coverage was “purchased directly,” excluding those who also reported Medicare, Medicaid, military, or other public coverage. The states are: California, Colorado, District of Columbia, New Mexico, New York, Ohio, Oregon, Rhode Island, Vermont, Virginia, and Washington. These states are: Colorado, District of Columbia, New Mexico, Oregon, Vermont, and Washington. Three of the remaining five states had some small group filings available, but we do not analyze those filings due to missing premium data in some filings, inability to find filings for large issuers in the state, or lack of clarity on how to develop accurate rates by age from the filed rating factors. In New York, while small group premiums for silver plans are available, the State notes that they are not comparable to pre-Affordable Care Act premiums. See press release referenced in footnote 6. Data on average small group premiums used for comparison comes from tables published by the Internal Revenue Service for 2012 average premiums by state. See http://www.irs.gov/pub/irs-pdf/i8941.pdf. The IRS tables are based on 2008-2011 MEPS-IC data, trended forward to 2012. For comparison to the 2014 individual market premiums, we trended the IRS estimates forward to 2014 using estimates of per enrollee private health insurance spending increases from 2012 to 2013 and 2013 to 2014 from the CMS Office of the Actuary. These estimates are 3.7% for 2012-2013 and 3.4% for 2013-2014. Many people would expect that actual trend will be higher than these estimates. To the extent that actual trend is higher, our analysis is conservative – that is, true savings are likely higher than those estimated here. From the Health Intelligence Company, LLC (HIC) database. Actuarial values are imputed based on plan characteristics. Estimates derived from the Kaiser Family Foundation/Health Research and Educational Trust 2012 Employer Health Benefits Survey microdata. Estimates limited to employers with fewer than 50 employees that reported a deductible, maximum-out-of-pocket, and whether the maximum-out-of-pocket was inclusive of the deductible. The age distribution for the current small group market was estimated using the 2012 Current Population Survey. We analyzed the average age and age distribution for individuals with ESI in their own name who report working for a small employer and have no dependents in their household with dependent ESI. The average age of small group employees covered by single coverage is approximately 45. However, the standard age curve rises steeply after age 45. As a result, the weighted average standard age factor that we use in the analysis is close to 50 – that is, we compare status quo small employer average premiums, trended forward, to the premium that would be paid by a 50 year old purchasing silver coverage in 2014.